Got questions about collagen powder side effects? We’ve got answers. In this article, we’ll explain what collagen powder is good for, who can use it, and what to watch out for if you’re concerned about collagen peptide safety. You have probably heard of it before. Collagen powder has been a popular health buzzword for a while. Collagen, a protein that binds tissues, is the most abundant protein in the human body, found primarily in connective tissues such as hair, nails, tendons, and ligaments. In powdered form, collagen hydrolysate (aka collagen peptides) is a white powder made from the connective tissues of animals. It contains easy-to-digest proteins that can help heal or strengthen human connective tissue. Collagen hydrolysate and gelatin are closely related and both are beneficial to your health. Both of them come from collagen-containing tissues and contain the same amino acids, but they are chemically different. Gelatin comes from cooking connective tissue, which extracts gelatin while leaving the proteins in longer chains. These longer protein pieces mean that gelatin can only dissolve in hot water and will cause liquids to gel once cooled. Collagen hydrolysate (collagen powder) is a more intensively-processed form of collage which breaks the protein chains up into smaller pieces. These smaller protein pieces mean that collagen hydrolysate will dissolve in cold liquids and will not cause liquids to gel. It also means that collagen hydrolysate is easier for the body to digest. What are the side effects of taking collagen? 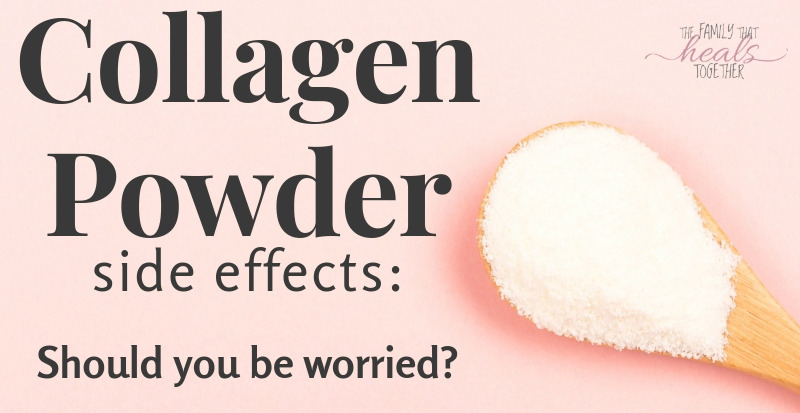 When it comes to side effects, collagen powder has very little downside. There are few side effects and the FDA has designated it “generally recognized as safe” (GRAS). Improving the health of skin, hair, and nails. As the body ages or you deal with chronic health issues, the collagen in connective tissues can decrease, leaving them weaker and less elastic. Supplementing your diet with collagen can help strengthen and improve elasticity. Slowing or reducing painful joint issues. The cartilage in your joints, as well as the tendons and ligaments that are responsible for flexion, are also collagen-rich tissues that can stiffen and degrade over time. Supplementing with collagen can help keep your joints healthy and happy. Improving gut health. Collagen is essential to a healthy gut lining. When leaky gut is at play, collagen helps to heal and repair the gut wall, thereby helping to reduce inflammation. Providing easy-to-use amino acids. The amino acids in collagen offer a variety of benefits to the body, from building muscle mass and increasing energy and metabolism to slowing the effects of aging and speeding healing. Amino acids even improve the health and function of vital organs like the heart and liver. Improving the health of your teeth and bones. Collagen can help prevent bone degradation, like what you see with osteoporosis. It also aids in the mineralization and stability of dental tissues. Is collagen safe to take? As mentioned above, collagen is GRAS with few known side effects. The biggest risk is if one is sensitive to the protein of the source animal itself. If you are sensitive to beef, for example, then it would be best to avoid collagen powder sourced from beef. Instead, look for marine collagen powder. How much collagen should you have a day? How much collagen you should have per day depends on your goals and health. If you are looking to improve the appearance of your skin and hair, aim for 1-5 grams per day. If you’re looking to prevent muscle loss with collagen powder, then you would be looking at upwards of 15 grams per day. Up to 30 grams for athletes and those dealing with digestive dysfunction or joint pain. From a caloric perspective, pure collagen supplementation cannot make you gain unwanted weight because there should be nothing in it but collagen, which is a protein and will not lead to an increase in calories consumed. If anything, collagen has been found to have a suppressant effect on appetite because it keeps you full, longer. What collagen can do is help increase muscle mass and burn fat. This may contribute to an increase on the scale, but that increase will be in muscle tissue. As muscle mass increases, so too does metabolism which leads to an increase in fat burning. As mentioned before, collagen itself has few known side effects. That being said, there are some factors to take into consideration. Poorly-sourced collagen can contain additives that are unnecessary and potentially detrimental to your health and gut, even going so far as to spur allergic reactions. The health and lifestyle of the animals used to make the collagen come into play, as well. Cattle raised in feedlot/CAFO operation eat a diet rich in GMO corn and soy (problematic in its own right) and other feedstuff that has been treated with glyphosate. There is evidence to indicate that due to the molecular similarities between glyphosate (a toxic chemical) and glycine (an amino acid found in collagen), glyphosate can mistakenly be assimilated into collagen in place of glycine, contributing to a whole host of health issues. You will also want to avoid collagen sourced from farmed fish used to make marine collagen powders for similar reasons. In other words, quality matters! Another area of concern is the potential for collagen powder to raise oxalate levels in the body. Elevated oxalate levels, especially the urine, can raise the risk of developing kidney stones in at-risk individuals (approximately 10% of the population). To determine if this is you, it may be best to have your urine oxalate levels tested before committing to long-term or high-dose collagen supplementation. Ensuring optimal levels of vitamin B6 works to neutralize the risk of elevating oxalate levels in response to collagen supplementation. Being diligent to stay well-hydrated also reduces the risk of developing kidney stones. Due to the potential to raise oxalate levels, collagen may also be problematic for those dealing with SIBO and other forms of oxalate sensitivity. So how do you know what collagen powder to buy? I recommend Perfect Supplements Hydrolyzed Collagen or Perfect Supplements Gelatin, depending on your needs. Perfect Supplements goes to great lengths to ensure a safe and high-quality product. Their collagen is sourced from 100% grass-fed cows and is rigorously tested to ensure product purity and that it is free from glyphosate and other contaminants like pesticides and hormones. Perfect Supplements is also lower-priced than comparable brands, despite being super high quality! The company offers multi-item discounts, plus you can save an extra 10% using the code FAMILYHEALS10. If bovine collagen is not an option for you, Vital Proteins makes a good quality marine collagen supplement from the scales of wild-caught whitefish. For the majority of people, collagen is a safe and low-risk way to increase protein intake and support the health and strength of connective tissue for kids and adults alike. 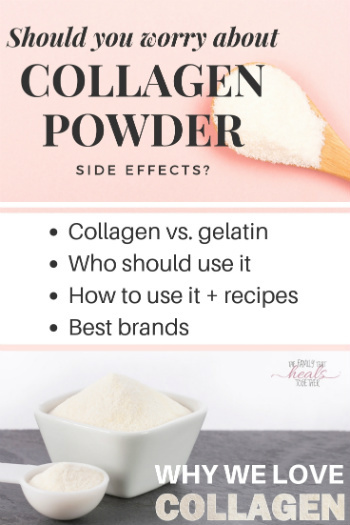 How do you use collagen powder? Share with us in the comments! 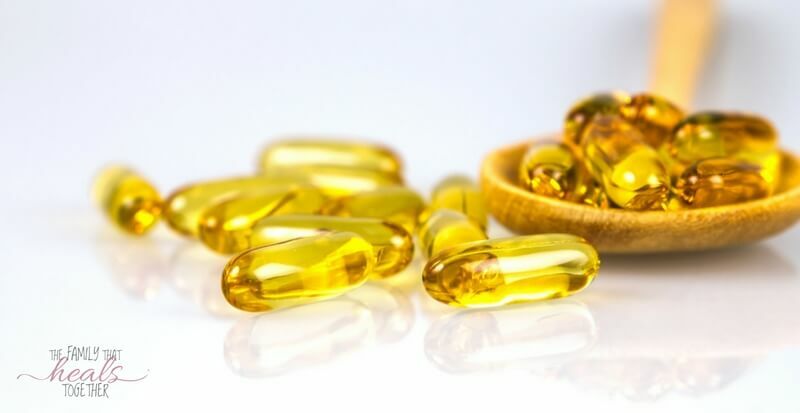 If you’re not familiar with the benefits of cod liver oil, you’ll want to read on to learn more about this ancient super food supplement. Contributor Stefani gives us all the details below. The benefits of cod liver oil have been known for centuries. Natives in northern Europe used it to protect them from the cold winters. (source) At the beginning of the 20th century, it was discovered that cod liver oil was effective in preventing rickets, a disease linked to a vitamin D deficiency. Parents started giving it to their children, and studies began to show that it reduced upper respiratory infections. (source) It’s no longer as popular as it once was, mainly due to the strong taste, however, it’s beginning to make a comeback in recent years. What are the benefits of cod liver oil? Cod liver oil is just as it sounds: it’s an oil made from the livers of codfish. It’s a good source of vitamins A & D, and omega-3 fatty acids. Because the Standard American Diet is too high in omega 6 inflammatory fatty acids and too low in omega 3 anti-inflammatory ones, taking a cod liver oil supplementation is wise. Additionally, the benefits of cod liver oil go beyond pain relief and healing glaucoma, to actually boosting and maintaining immune function in the body. Vitamin A deficiency causes an increased risk of infection. Additionally, infections increase the body’s need for vitamin A, which creates a downward cycle of health. Direct sunlight is the best source of vitamin D, but our indoor lifestyles, cloudy climates, and increasing air pollution affect the amount we receive. Therefore, researchers believe that half of the world’s population is vitamin D deficient. (source) Our culture’s overuse of sunscreens also decreases the amount of sunlight we receive. Wearing a sunscreen of 30SPF reduces vitamin D absorption by the skin by more than 95%. The beneficial omega 3 fatty acids that are present in cod liver oil are eicosapentaenoic acid and docosahexaenoic acid (EPA and DHA). These are the same fatty acids that you can find in cold water fish such as salmon, mackerel, and sardines. EPA and DHA are far superior to other omega 3 fatty acids such asalpha-linolenic acid (ALA), found in chia seeds and flax seeds. While ALA still has benefits, you’d have to eat a great deal more of these foods than those with EPA and DHA to get the same benefit. Gaining the benefits of cod liver oil is simple, but your top priority should be finding a high-quality source because not all of them are created equal. The biggest concerns to consider when choosing a cod liver oil are the source of the fish, the process of extraction, and whether or not there are any other additives. Cod liver oil is highly fragile. It oxidizes easily when exposed to light and oxygen, which ruins the product. This is why great care must be taken during the production process to prevent oxidation (spoilage) and protect the nutrients in the cod liver oil. It is important to AVOID cod liver oil that contains low levels of vitamin D in relationship to vitamin A. The ideal ratio of A to D is no greater than 10:1 (for every one unit of vitamin D there should be no more than 10 units of vitamin A). With industrialized processing, these ratios can become imbalanced and the risk for vitamin A toxicity becomes greater. You will find that the purest, least processed cod liver oils have a ratio near the ideal 10:1, because when the vitamins are naturally occurring, rather than synthetic, they are naturally balanced. Who needs the benefits of cod liver oil most? Cod liver oil is a traditional, ancient super food that various cultures have long depended on for health, vitality, and fertility. Yep- cod liver oil is super important for fertility. Those planning to become pregnant, or those who are pregnant or breastfeeding need cod liver oil the most, as the omega fats in cod liver oil nourish the brains of growing babies and children. Yep- kids need it too. Growing brains and bodies can benefit greatly from cod liver oil supplementation. Especially in the winter. Yep- vitamin D is scarce in the winter. Which means we can all benefit from cod liver oil supplementation, particularly during gray and cloudy seasons, in order to bolster the immune system when the sun can’t give us the vitamin D we need. Each batch of Rosita EVCLO is carefully handcrafted without heat, chemicals or exposure to metal in Rosita’s dimly lit, cool facility. First, after removing the livers from the fish, they gently expose them to near-winter conditions (like the cold waters where the fish swim). They then gently allow the livers to warm up to just a bit above freezing. This gradual shift in temperature and pressure breaks down the liver cells. Within an hour or two, they release the oil with all its nutritional goodness. The oil is then gently filtered using a natural marine material that absorbs contaminants like a magnet for easy removal. Next, the oil goes through a series of paper filters. Each batch is tested twice to meet strict EU standards for export and to ensure it’s free of heavy metals and contaminants. Rosita Extra Virgin Cod Liver Oil is truly an artisan product and gives you the nutritional benefits of a whole, nourishing food. The truth is that I would rather give myself and my children smaller doses of this high quality oil and ration it than use a cheaper oil. Extra virgin cod liver oil is the highest quality cod liver oil available. You can purchase the liquid here and the capsules here. Please note that we do not recommend fermented cod liver oil at The Family That Heals Together. We’ve written extensively about why we don’t recommend fermented cod liver oil. You can read about that here, here, and here. All signs point to fermented cod liver oil being rancid and causing health issues. In addition, the product appears to contain vitamin D2, not the desirable and absorbable D3, and the A to D ratios are way off. In addition, testing found that the oil used in fermented cod liver was not even true cod! As far as processing, fermented cod liver remains shrined in secrecy, so it’s unclear how the oil is actually fermented, lending to the uncertainty of safety and possibility of rancidity. What about cheaper oils available online and at health stores? While the benefits of cod liver oil are many, they are dampened by chemical processing and added ingredients. While some lesser quality oils may provide some beneficial omega fatty acids, they should not be depended on for quality vitamin D supplementation. The cod liver oil industry has huge differences in the quality of oils from the various companies that produce it. The best way to ensure that you are getting the incredible benefits of cod liver oil is to thoroughly research the product, practices, and source prior to making a purchase. Because magnesium is needed for virtually every function of the body, it helps to know which types of magnesium are the best. Should you supplement? Eat foods high in magnesium? Find out below! As someone who doesn’t take a ton of vitamins (I, instead, rely more on homemade herbal extracts), I am really picky about the supplements I take. I’d like to think we can get the majority of our vitamins and minerals from our food, but, unfortunately, with modern farming depleting our soil of nutrients, that’s not as easy as it once was. That’s why I take different types of magnesium to ensure that my needs are met, as magnesium is important to every bodily system and function. Should I take a magnesium supplement? That’s a good question, and one each individual should consider. I’ve written about how a special type of magnesium has helped with my son’s behavior, and that it was recommended by a practitioner we were seeing. Though we later received test results that did confirm magnesium deficiency, our practitioner had us start on the supplement before we had the tests run. I think this a good example of the fact that most of us could probably benefit from magnesium supplementation. If you’re not sure, maybe the following list of magnesium deficiency symptoms will be helpful. Basically, magnesium is really stinkin’ important! 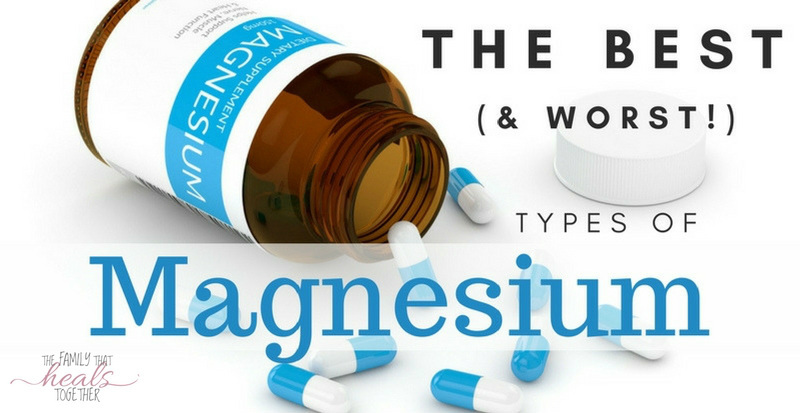 If you have any of the above symptoms, you may find that you need a magnesium supplement. Increasing food sources of magnesium is also beneficial. Now that you’ve decided to supplement magnesium, how do you decide which one to take? There are so many available on the market. Magnesium citrate- this popular type of magnesium is used most frequently to keep users regular. While it does ease constipation, the way in which it does it isn’t the best for us. Mag citrate actually pulls water into your intestines, which can lead to dehydration. What’s worse, this type of magnesium can reduce ceroplasmin levels, leading to mineral imbalances and deficiencies. Finally, there is evidence that the most popular magnesium citrate on the market may contain high levels of arsenic (the original reason our family ditched it several years ago). Magnesium hydroxide- like magnesium citrate, magnesium hydroxide moves the bowels by drawing water into the colon. In addition, side effects include nausea, fatigue, and loss of appetite. 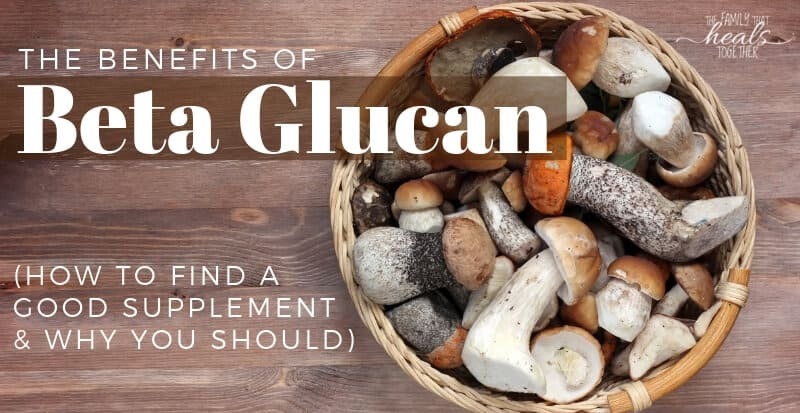 Magnesium aspartate and glutamate- because the amino acids aspartate and glutamate are excitotoxins, it’s important they do not become imbalanced. While consuming them as part of a complete protein with numerous other amino acids in foods like collagen is ok, it is not wise to supplement them independent of other amino acids. Muscles cramps and spasms- try a combination of well-absorbed Wake Up Maggie in the mornings to address magnesium deficiency, then a magnesium lotion rubbed on your legs at night. Better sleep- try taking an Epsom salt bath before bed, along with Good Night Maggie, which contains calming forms of magnesium. Get Good Night Maggie here. Neurological conditions- Magnesium L-Threonate, found in MagMind. Constipation- Magnesium oxide like this. Cellular energy- a combination magnesium supplement like Wake Up Maggie, which contains the co-factor boron is a great option for increasing energy and getting magnesium into the cells. My favorite high-quality magnesium supplement by far is Wake Up Maggie from Organic 3. It is a combination of magnesium malate, orotate, and taurate, with the added co-factor boron, important for absorption. Wake Up Maggie is my absolute favorite magnesium supplement because I FEEL better when I take it- more energized, clear-headed, and happier. 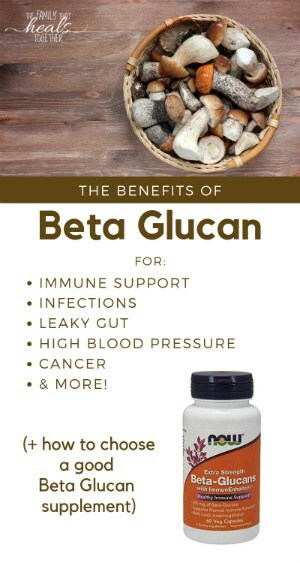 I add it to hot tea in the mornings to make a bulletproof tea, stir it in a little water, or add a scoop to a smoothie. It’s pretty tasteless and easy to get down, especially if you blend it in something. I have found it to be worth every penny, honest. Get it here. UPDATE: if Wake Up Maggie is out of stock, try Goodnight Maggie. Magnesium oxide- to stay regular. This one is super cheap and very clean. You can take up to 2,000 mg at bedtime to produce a bowel movement the next AM, and be warned, it WILL move things along. You can also take smaller doses throughout the day for a less intense effect. Magmind- one of our favorite supplements for combating symptoms of ADHD like hyperactivity and impulsivity, this supplement is one you can usually find in my cabinet. Read more about why we love it here. Magnesium chloride lotion- a good way to absorb magnesium to bring levels up, using a lotion or oil topically helps with bio-availability. Make your own easy lotion using this recipe, or try a spray oil like this. Magnesium sulfate baths- aka Epsom salt baths. These are great to relax before bed and improve sleep, as well as aid the body in detoxification, particularly in times of major healing. If I could only choose one magnesium supplement, it would, hands down, be Wake Up Maggie. Obviously I’m partial because I’ve had such a good experience with it, but feel free to browse the list above and experiment based on the different properties of the different types of magnesium to choose the best magnesium supplement for you. So here’s the thing. I’ve told y’all how I don’t like coffee ’cause I’m not a real grownup, which has lead me to create bulletproof tea and chocolate milk recipes. And lately, with the craziness of adjusting to a hubby who travels a lot (which = really bad sleep for me), and having to show our house over and over with four kids underfoot (thankfully, we’ve all gotten pretty good at our “get the house show-ready” routine and I’m grateful for my boys’ help), I’ve been wishing I was a coffee drinker ’cause I’ve heard it can bring the dead back to life or something like that. But I don’t like coffee. In fact, I hate the smell of it even, so using it to revive my dragging self in the mornings is a no-go. I really do love a good bulletproof tea though. And after telling you about the energizing benefits of a special type of magnesium, which is the highest quality formula I’ve ever found, I decided to take my average bulletproof tea a step further. Don’t get me wrong, making a drink bulletproof is anything but average, but you know how I like bumping up my nutrition any way I can, ’cause as a mom of four busy boys, I get little time to do a lot of fancy finagling for it. Not to mention I really like being sneaky with ingredients that my boys don’t suspect (like in this chili recipe), so when they steal a drink of my tea, which they inevitably do, I love that they get a hit of my secret ingredient. Before I reveal the secret, let’s talk about the usual bulletproof ingredients. 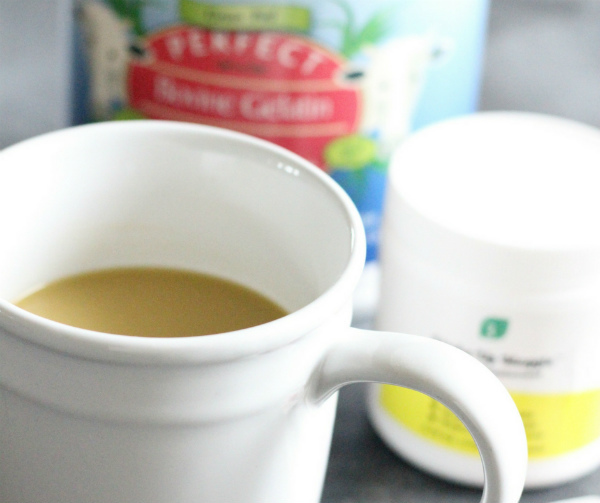 Collagen- You can get collagen into your tea or coffee in a number of ways. Use a scoop of hydrolyzed collagen. This is probably the easiest way, because hydrolyzed collagen dissolves in any type of liquid, hot or cold. It is, however, slightly more processed than regular gelatin, which is more of a whole food. It still offers protein + the gut-healing, hormone-supporting benefits of amino acids. Get grassfed hydrolyzed collagen here. Use a scoop of gelatin. An awesome option for hot drinks like this bulletproof tea, gelatin requires heat and lots of stirring to dissolve well. Though it’s less refined than hydrolzed collagen, gelatin can be difficult to dissolve well, but it’s an excellent source of nutrition, including protein and amino acids. Get grassfed gelatin here. Add a scoop of my DIY hormone-support supplement. 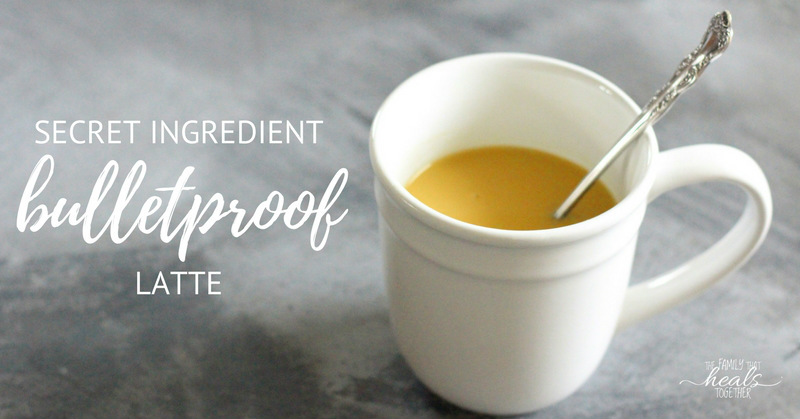 Containing hydrolyzed collagen, as well as good fat in dehydrated coconut milk, and the extra nutrition of powdered greens, I often use this supplement in a bulletproof chai tea latte for ultimate nourishment in a mug. Grab the recipe for the DIY supplement here. MCT oil: I’ve always been cautious about using MCT oil, because it isn’t a whole food, rather the separated, liquid fat from coconut oil. MCT (short for medium chain triglycerides) contains fats that are easy for our bodies to quickly use, sending them directly to nourish the liver. After I bought Mr. Incredible some MCT oil for Christmas, I was convinced of the health benefits. He became energized, more clear-headed, and dropped a bunch of weight quickly. Our family uses Perfect MCT Oil, which you can get here. Grassfed butter: I always have this on hand in my kitchen, so it’s an obvious choice. 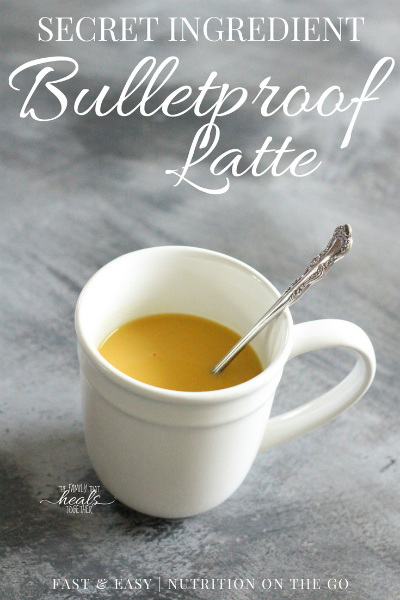 Grassfed butter is a good source of heart and brain-healthy saturated fat and omega 3 fats, as well as vitamin K. Plus, it adds a frothy creaminess to bulletproof tea. Cream- Like butter, real cream is a good source of good fats and vitamin K. Make sure it’s grassfed, and, preferably, raw (though I use the best quality organic, grassfed cream I can get when I can’t get raw). As I’ve already mentioned, the special ingredient is a special type of magnesium, which is formulated by the same folks who gave us GutPro, so you can bet it’s the best quality available, free of fillers and artificial ingredients. I’ve been using this awesome type of magnesium that contains not one, not two, but three types of superior magnesium, along with the important cofactor boron for better absorbability. It’s called Wake Up Maggie and it does just that- wakes you up. Wake Up Maggie is better than coffee for imparting clear-headed, clean energy in the mornings. The unique combination of magnesium malate, taurinate and orotate is designed to pep you up and keep you alert for the day ahead. The days that I drink this bulletproof tea latte, I feel awake and energized, but more than that, I feel strangely euphoric. Happy and joyful. I know it sounds a little kooky, but I really believe it’s the brain-supporting nutrients in the magnesium and MCT oil. Magnesium really is one of the most needed minerals, as it’s used in nearly every function of our bodies, yet, it’s one of the most common deficiencies. We all suffer from the above conditions from time to time, but after suffering from all of them for years, I began researching magnesium supplementation. You may not be surprised to know there are a TON out there. Wake Up Maggie is the first that I can actually feel a difference with, soon after taking. Get Wake Up Maggie here. You can add these ingredients to whatever you fancy in the mornings. For me, it’s chai tea, and I don’t get too complicated about it. I use either this organic chai tea or this organic Tulsi Chai Massala, which is made with an adaptogenic herb (tulsi = holy basil) and has slightly less caffeine. Combine ingredients in a mug and stir well, OR use a stick blender to create a nice froth OR add to a blender to blend before returning to your mug to enjoy. Nutrition doesn’t have to be tricky. We don’t always have a ton of time to devote to preparing food or getting supplements down, but starting your day with a bulletproof tea, latte, or coffee can be an easy way to quickly get some goodness down your gullet. Do you make bulletproof tea or other drink? 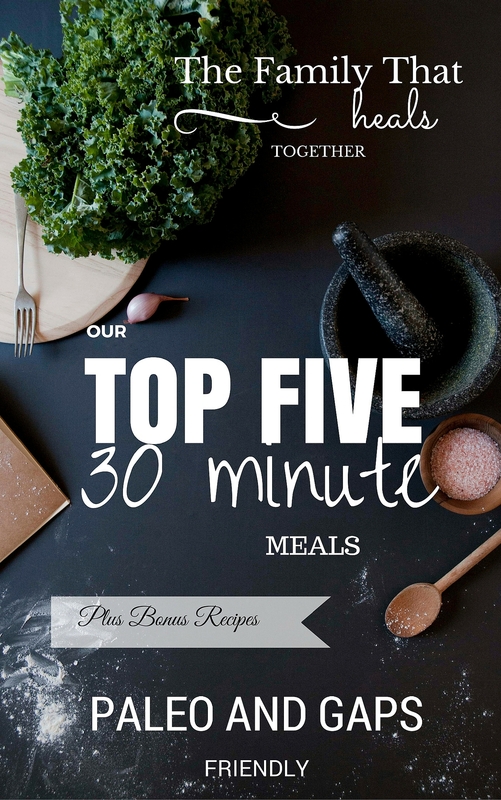 What are your favorite ingredients to add? Be sure to share using one of our links or pin the image below.